I can't believe its week 14 already. I started to follow Leah's quilt along starting week 4 and it has been a amazing journey so far. I just learned FMQ starting of this year and happy with my progress so far. This week was really fun for me. I didn't have any completed top. So, I worked on a new quilt and then got side tracked ;). Hmmm....What's new, right ;)? Okay here is the deal, the quilt pattern I'm working on is X's and O's. 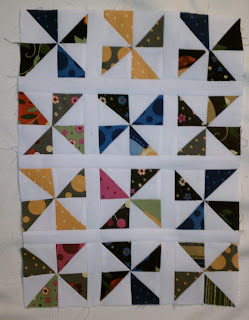 If you like this check out this wonderful tutorial from Jenny@missouriquiltco.com : X's and O's Quilt. I'm totally in love with my new Singer Quantum Stylist 9960 sewing machines. It pieces amazing and the the quilting is awesome too. I can see a huge improvement from my old Brother XL2600i machine. This is my first quilt pieced and quilted on the new sewing machine. I can only imagine how the "Janome" machine would be. But can't afford those for now. 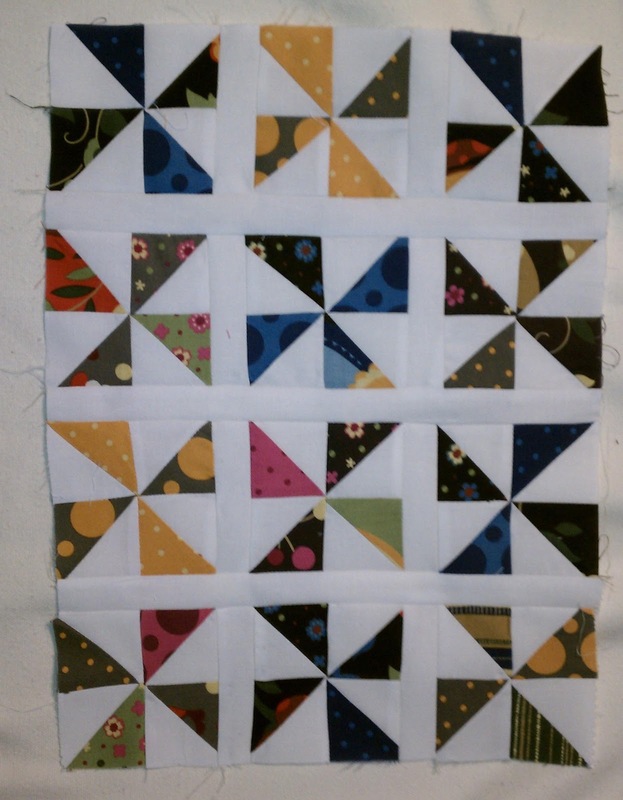 I was so thrilled with another tutorial of Jenny@missouriquiltco: Serendipity Quilt where she shows a trick to make use of the fabric which you trim away while creating your X's and O's block. 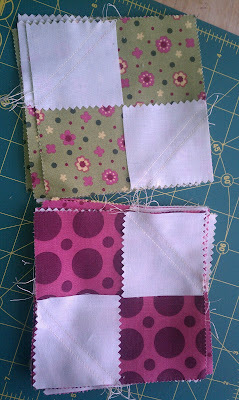 So, I decided that I will save all those little pieces and make a doll quilt. So, this is what I worked on this week. I thought it was an easy process but it ended up as a big project. I put my heart and soul in it and didn't try to rush through it. It really turned out cute and this is going to be my daughter's doll quilt. She named her doll "Melody", so I appliqued the name for her. She is absolutely trilled :-). The fabric line I used is Moda's Rooftop Garden. When I saw some of the quilts made with this line they were too dark and felt that not everyone is going to like these colors. But I was totally in love with this fabric line. 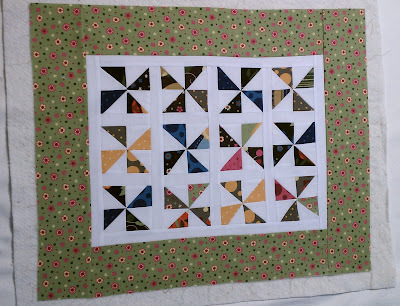 To lighten up the quilt I added the while Moda Bella solid and I'm happy with how it turned out. 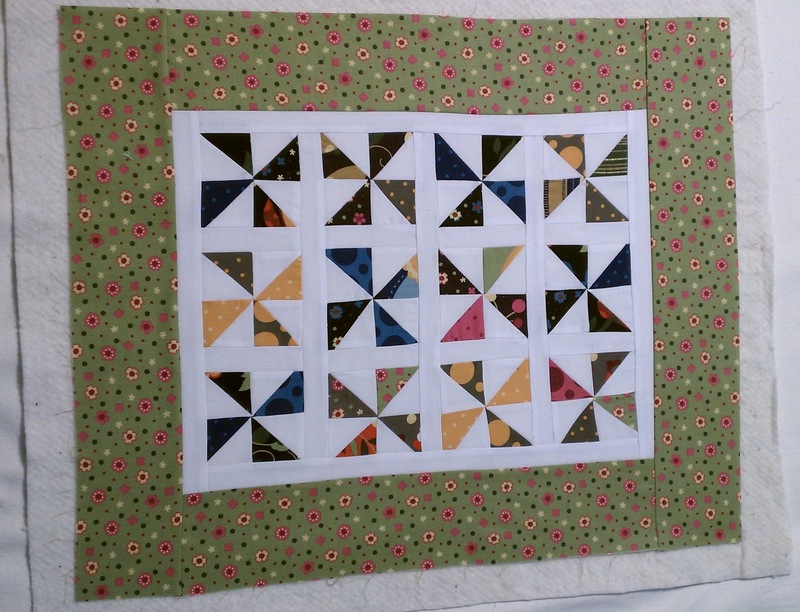 The finished Pinwheel quilt blocks measures 3.5x3.5 inches and I used a total of 12 blocks with 4 rows and 3 across. I made mistakes while trimming few of the blocks, so some of them are wonky :-). 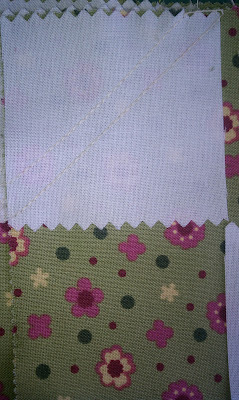 Next week, I will finish the binding using the Pink polka-dot fabric used for applique. Your quilt is awesome. The stippling is awesome too. I like how you made the name on the quilt. I love to use all those leftover pieces. you can use them in table runners, potholders, just about anything. I have two boxes of them. One box of Christmas and the other of everyday ones. Cant wait to see your sharp stippling. I keep having to go back to her tutorial. Thank you, Sew Gramy. I know its so amazing to know what we can do with those left over fabrics. I found it easy to do something with them as I had already made those tiny blocks. I did the flame stitching for one of my quilts before. So, I feel the sharp stippling is a combination for flame FMQ and stippling. Can't wait to try it out.